We assume you want straight, white, gleaming teeth, right? Brushing, flossing and regular cleanings are a good start, but if you are one of the millions of people who grind their teeth at night you may need a mouth night guard to keep your smile looking its best. For effective protection against damage caused by grinding your teeth in your sleep, visit your dentist to own professionally fit mouth night guards. Teeth grinding, also known as bruxism, can occur from a dental problem such as teeth in need of repair or realignment. In other cases, stress or anxiety can bring on this dental issue. Grinding, clenching or gnashing your teeth when you sleep can cause a swollen jaw as well as erode the protective enamel, leading to painful sensitivity to hot or cold foods. If you suffer from bruxism, you are not alone. The American Dental Association (PDF) reports this condition affects an estimated 30-40 million people in the United States. Among adults, this translates to a 10-15 percent occurrence of teeth grinding or clenching. The problem is even more common among children: An estimated 30 percent of kids between the ages of three and 10 experience this issue. Despite being so common, you may have a difficult time determining if your child suffers from bruxism. Checking on them while they sleep is a good method, as is asking their brothers or sisters if they hear grinding noises at night. Complaints of pain when chewing or a tender jaw can also be a sign of teeth grinding. If you suspect your child is suffering from bruxism, be sure to discuss the problem with your family dentist. 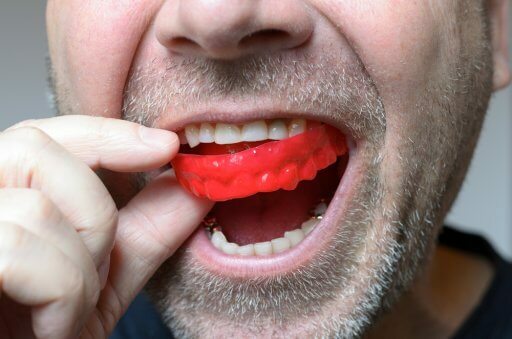 When considering your options for a night mouth guard, you will likely come across two basic solutions: store-bought, DIY guards, and custom-molded guards created by a dentist. Many retail stores offer DIY mouth guards at a very reasonable price. The process of fitting these guards is referred to as “boil and bite,” where you boil a pot of water and drop in the pliable plastic guard to soften it. Once it cools down sufficiently, users insert the guard into their mouth and bite down to make an impression of their teeth. In addition to the more accurate process used to create your night mouth guard, dentist-created guards are made of a high-grade material that lasts much longer — typically up to three years or more. Guards made of “boil and bite” pliable plastic often wear out quickly and need more frequent replacing, as often as every three to six months. Additionally, the less secure fit of do-it-yourself guards may result in poorer protection of your teeth. In some cases, the fit is so loose that users often find their guards under their pillow or sheets in the morning, where they do no good at all. Visit us at Orange Beach Family Dentistry for a Mouth Night Guard! If you or your child suffer from bruxism, make an appointment immediately with our friendly Orange Beach Family Dentistry team. We can fit your protective dental wear perfectly, and even offer night mouth guards in various colors and styles to match your snazzy pajamas. Don’t hesitate to reach out to us to discuss the benefits of a night mouth guard or any other dental work you or your family may need!